The name huss is a general catch-all for pretty much all species of dogfish and catsharks. If you've had rock salmon in a chippy, it’s similar to that. Nine times out of ten, it’ll refer to the lesser spotted dogfish. These are found from Norway all the way to Senegal and into the Mediterranean. They’re elasmobranchs, belonging to the family of sharks and rays. These are cartilaginous fish and lack the calcified bones of, you guessed it, bony fishes. Elasmobranchs are susceptible to overfishing, they’re slow to mature and, unlike most fish, they don’t lay millions of eggs. They invest in fewer, better developed offspring, with higher chances of survival. Some sharks give birth to live young, to give them even more of a head start in life. Dogfish lay eggs though- the 'mermaids purses’ you find on the beach are their egg cases. That said, dogfish are pretty abundant all over the Northeast Atlantic, unlike their cousins the spurdog, whose numbers have fallen drastically over the past 50 years. While we’d never give you spurdog, or porbeagle shark, our fishermen occasionally get dogfish in the nets and we see them as an occasional treat. While not reproducing quite as quickly as their bony cousins, dogfish are very robust animals and have very high survival rates when they’re discarded (caught but thrown back in the sea). After the collapse of the cod fishery off the Grand Banks, dogfish populations rocketed, partly due to a lack of predation by cod, but also because they could be caught in a trawl net, chucked back in and happily swim away. Large hauls of dogfish are common after big storms, when they come in to feed on all the bits and bobs smashed and scattered by waves on the rocks. All huss will have been skinned by the time you get it, because it’s a bugger of a job. Most of the meat is along the tail section. These can either be roasted whole, or cut into thumb length portions and fried or braised. 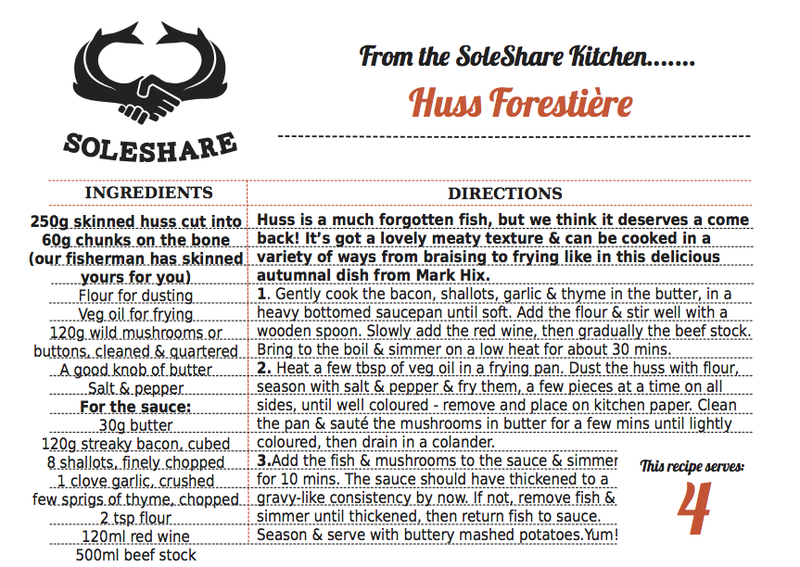 You can pair huss with some big flavours and it will still shine through. It’s got a distinct flavour that works amazingly well in a Goan or Keralan fish curry, baked whole with a parmesan crust or braised like osso [husso] bucco.